See how much easier life is in the cloud with powerful, scalable services built for businesses. 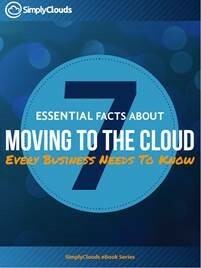 Have you considered moving your business to the cloud yet? Here’s why you should. You’ll always access the most current technology thanks to our continuously updated cloud systems. Instead of being locked into in-house servers that quickly become obsolete, forcing you to spend on costly upgrades, you’ll have the peace of mind that comes with knowing that you’re always current. You’ll empower your employees to work on anything, from anywhere and at any time. SimplyClouds Hosted Desktop supports a range of devices including smartphones (Windows, Android, or iPhone), tablets, laptops, Macs, PCs, and thin clients. You’ll never have to make that last minute trip back to the office again. You’ll escape the large, upfront, perennial capital expense of IT infrastructure in favor of a much lower monthly “pay-as-you-go” operating expenditure. We handle all maintenance and support, reducing your need for in-house IT staff. Moving to the cloud can be stressful and requires technical expertise you may not have. Don’t worry, that’s where we come in. Here’s what makes SimplyClouds different. You can move to the cloud with little or no technical expertise with our intuitive and easy-to-use online marketplace. Or we can help guide you step-by-step via live chat or a toll-free phone call. You can move some of your applications to the cloud, while keeping the rest where they are, so you don’t have to commit fully to the cloud. We can present all your cloud and on-premise applications to your Hosted Desktop, which can be accessed from any device, providing you with greater freedom to work. Some businesses can’t run completely in the cloud with just Office 365 or Google apps because they need to access industry-specific or custom applications that are still running on on-premise servers. If that is you, SimplyClouds can help you move these mission-critical applications to the cloud. There are no long-term commitments, and you can cancel at any time. You can also try some of our popular services before buying them. We guarantee 99.9% uptime, or we give you a credit towards the monthly fee for any affected service. Our SSAE 16 compliant data centers feature redundant hardware components, power, A/C, and Internet connectivity, featuring high-performance, fault-tolerant servers that are monitored 24/7 by our Network Operations Center. Your data is safely and fully protected by enterprise grade firewalls and intrusion detection systems, while continuously replicated and backed up. Our data centers are under 24/7 guarded access and video surveillance. Our services are backed by world-class, fanatical customer service and support.